The heat is on, so it’s time so dust off the ice cream churn. I’ve had spectacular success making gelato and sorbet recipes from Nick Palumbo’s recipe book “Gelato Messina” in the past couple of years. I’ve made the dairy free chocolate gelato over and over for the chocolate lovers in the household. It’s reliable and delicious, but too rich for my taste. Personally I prefer a fruity sorbet. I’ve made the strawberry sorbet from the book a number of times too. It never fails to impress me with it’s intense strawberry flavour. Just once I used fresh strawberries but I confess I much prefer the result when I use frozen berries. Perhaps they are riper than those I buy fresh, perhaps they are a sweeter variety. Once you have mastered Palumbo’s technique, making the recipes are not at all daunting despite the way they read. With electronic scales, sugar thermometer, a whisk and a timer, the process, while precise, is simple. These recipes I make verbatim, I see no room for improvement. Gelato Messina’s gelato and sorbet recipes made at home are of outstanding taste and texture thanks to the use of specialty sugars and thickeners which inhibit the formation of ice crystals. They’re super smooth, and have an almost chewy texture. The sweetness is restrained, not cloying. There is nothing better than a scoop of luscious fruity sorbet to beat the heat. PS. Gelato Messina is reported to be opening a store in South Brisbane early 2017, yay!! **Specialty sugars for ice cream making are easy to source online. Before you begin, put the bowl and paddle of your ice cream churn in the freezer to chill. Put the water in a medium sized bowl over a double boiler. Put the sugar, dextrose and chatham gum into a bowl and whisk to thoroughly combine. When the water over the double boiler reaches 40C, whisk in the powders and continue to whisk until the mixture reaches 65C. This will happen in a couple of minutes. Remove the bowl from the heat and place into an ice bath, whisking the mixture every couple of minutes until the temperature returns to 40C. Cover the bowl tightly with foil and place in the freezer until the temperature drops to 4C. 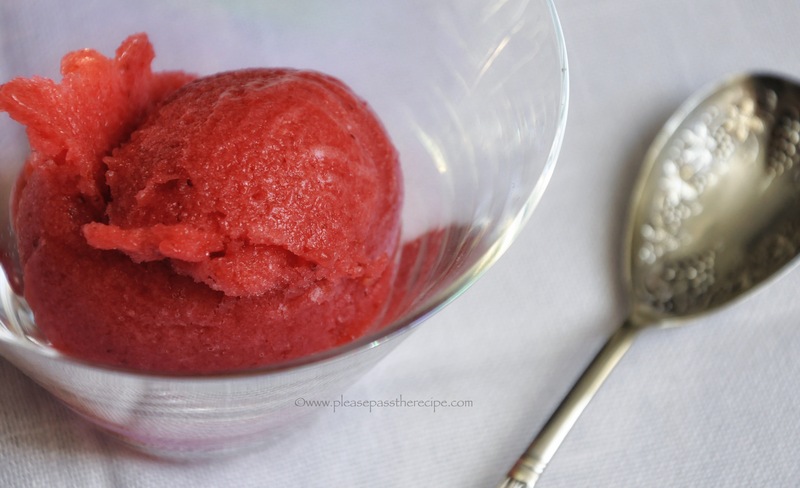 Puree the strawberries in a food processor then add them to the sorbet mixture. Blend well using a stick blender. Refrigerate for 4 hours to give the mixture time to cure. Assemble your ice cream churn and turn it on to begin the freezing process. Blend the strawberry sorbet mixture with a stick blender for 1 minute then pour the mixture into the bowl of the ice cream churn. Churn until the temperature reaches -4C, then transfer the sorbet to a metal container and freeze. Palumbo states that the sorbet shouldn’t be frozen overnight as it will impact on the texture. I find freezing overnight does changes the texture slightly but it is minimal. I’ll still happily eat this even after a week in the freezer, just allow it a little time to soften before serving. what does the xantham and dextrose do? Looks great. I have try and make some ice cream or sorbet this summer. I’ve been putting it off too long! I’m so impressed by your prowess with food. This looks delicious. Gee thanks, I love to eat, that’s what motivates me! I love strawberries, too…the deep, ripe ones. Just like your sorbet! Yes the small sweet strawberries are my first choice, usually not the prettiest but definitely the tastiest. Well, Sandra, another classic! Luckily I have all the ingredients, including strawberry purée I froze earlier in the summer. Will be making this soon – perhaps scoops presented in little pavlova baskets as I still have a freezer full of egg whites even after making endless macaroons to distribute as holiday gifts! It is a ripper Debi, really refreshing and with an intense flavour. Strawberries and meringue are always delicious together, yum… Everyone loves your walnut pastries, luckily I froze half the batch…. This entry was posted on December 22, 2016 by ladyredspecs in Cooking, Dairy Free, Desserts, FODMAP diet, Food, Fruit Desserts, Gluten Free, Lactose Free, Light dessert, recipes and tagged gelato, Gelato Messina, sorbet, strawberry.